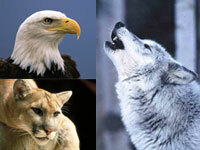 What do bald eagles, wolves, and grizzly bears have in common? If Representative Richard Pombo (R-CA) had been in Congress 32 years ago, they'd probably all be extinct by now. Why? Because two months ago, the House of Representatives passed Rep. Pombo's "Wildlife Extinction" bill, effectively gutting the Endangered Species Act (ESA), which turns 32 later this month. The vote was much closer than expected, thanks to the hard work of activists like you - but now the bill goes to the Senate. We need to turn up the heat on the Senate this week so our senators know that Americans value our wildlife. Who is Rep. Pombo, and why is he so keen on destroying the protections our most threatened wildlife depend on for their survival? He's is the powerful Chair of the House Resources Committee, and he has received hundreds of thousands of dollars in political contributions from corporate special interests - corporations which stand to profit if the Endangered Species Act is gutted. We can't let Pombo succeed in destroying the Endangered Species Act. Over these past three decades, the ESA's protection has brought the bald eagle back from the brink of extinction, returned wolves to Yellowstone National Park, and seen the Yellowstone grizzly bear population triple in size. But unless we can convince the Senate to reject Pombo's bill, the ESA will be decimated. This dangerous bill exempts all pesticide decisions from ESA compliance; replaces the current mandatory critical habitat system with an optional system that fails to protect habitat essential for recovery; and even requires the federal government to use taxpayer dollars to pay developers for compliance with the law! Imagine that - we could face a future where our government could not stop pesticide use even if it would lead to a species' extinction. How could anyone in Congress possibly vote for such a bill? The Senate is back in session this week - let's flood their inboxes and tell them that we will not let them put profit and greed above the survival and recovery of our most threatened and endangered species. The fate of the Endangered Species Act is now in the hands of the Senate. Sign our petition to protect the ESA today!